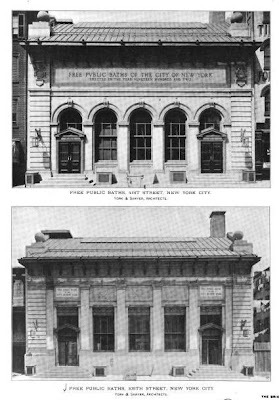 Two Free Public Bath buildings designed by York & Sawyer c. 1904 in New York City, one at 327 West 41st Street and the other at 243 East 109th Street. Click HERE to read a 1904 NYTimes article on the opening of the West 41st Street building and the technology employed and HERE for a comprehensive history of NYC's public bath buildings. 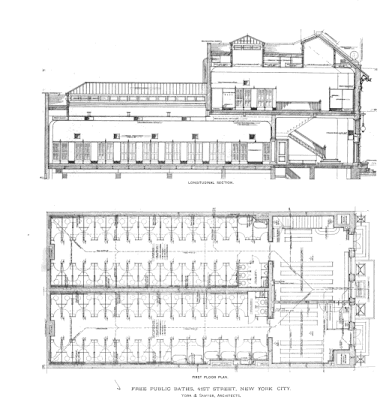 Both of these York & Sawyer designed bathhouses have since been demolished. Photos from The Brickbuilder, 1904. With some minor tweaks these facades could easily have served as banks, train stations or libraries in any city. Built back in the day as a public amenity to serve the numbers of people who didnt have access to such facilities in their own tenements. Too bad we dont put as much nobility and refinement in todays public buildings of any type. Moreover, and still more to the point, the trillions raised annually through federal, state and local taxes are spent on a definition of "the public good" that is simply different from what it once was. There is a York & Sawyer bathhouse still standing, at 135 Allen. It is now occupied by a church.